Considering that I myself am six feet tall. for by my chilindre it is pryme of day." ^ Moss, Tony. How do sundials work. 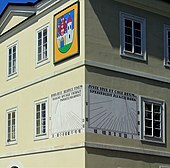 British Sundial society. [21 September 2013]. （原始内容存档于August 2, 2013）. 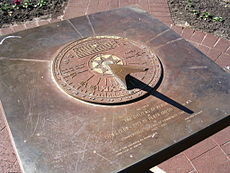 This ugly plastic ‘non-dial’ does nothing at all except display the ‘designer’s ignorance and persuade the general public that ‘real’ sundials don’t work. ^ Trentin, Guglielmo; Repetto, Manuela. Using Network and Mobile Technology to Bridge Formal and Informal Learning. Elsevier. 2013-02-08. ISBN 9781780633626 （英语）. ^ 3.0 3.1 3.2 British Sundial, Society. BSS Glossary. [2011-05-02]. （原始内容存档于2007-10-10）. ^ Rohr 1965, pp. 126–129. ^ Waugh 1973, pp. 124–125. ^ Michelle B. Larson. Making a sundial for the Southern hemisphere. [2008-07-11]. 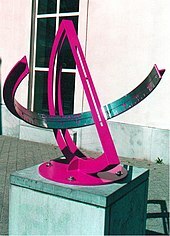 ^ British Sundial, Society. The Sundial Register. [2014-10-13]. ^ Waugh 1973, pp. 48–50. ^ Karney, Kevin. 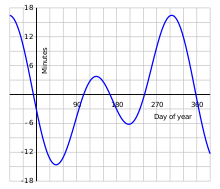 Variation in the Equation of Time (PDF). ^ The Claremont, CA, Bowstring Equatorial. Photo Info. [2008-01-19]. （原始内容存档于2008-04-22）. ^ Christopher St. J.H. Daniel. Sundials. Osprey Publishing. 4 March 2008: 47– [25 March 2013]. ISBN 978-0-7478-0558-8. ^ Waugh, Albert. 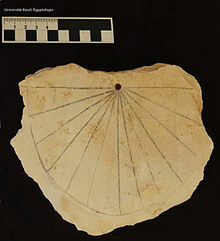 Sundials: Their Theory and Construction. New York: Dover Publications. 1973: 34. 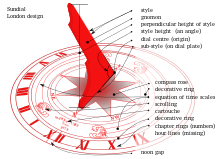 ^ Cousins, Frank W. Sundials: The Art and Science of Gnomonics. New York: Pica Press. 1973: 189–195. ^ Stong, C.L. The Amateur Scientist. Scientific American. 1959, 200 (5): 185–198. ^ The Sundial and Geometry p 38. 互联网档案馆的存檔，存档日期2016-03-04. ^ 17.0 17.1 Waugh 1973, pp. 106–107. ^ Waugh 1973, p. 205. ^ 19.0 19.1 Rohr 1965, pp. 46–49. ^ Mayall & Mayall 1938, pp. 55–56, 96–98, 138–141. ^ Waugh 1973, pp. 29–34. ^ Schaldach K. The arachne of the Amphiareion and the origin of gnomonics in Greece. Journal of the History of Astronomy. 2004, 35: 435–445. ISSN 0021-8286. doi:10.1177/002182860403500404. ^ Rohr 1965, pp. 49–53. ^ Mayall & Mayall 1938, pp. 56–99, 101–143, 138–141. ^ Waugh 1973, pp. 35–51. ^ Rohr 1965, p. 52. ^ Waugh 1973, p. 45. ^ Mayall & Mayall 1938, pp. 557–58, 102–107, 141–143. ^ Waugh 1973, pp. 52–99. ^ Rohr 1965, p. 65. ^ Waugh 1973, p. 52. ^ Rohr 1965, pp. 54–55. ^ Waugh 1973, pp. 52–69. ^ Waugh 1973, p. 83. ^ Morrissey, David. Worldwide Sunrise and Sunset map. [28 October 2013]. ^ 36.0 36.1 Rohr 1965, pp. 55–69. ^ Mayall & Mayall 1938, p. 58. ^ 38.0 38.1 Waugh 1973, pp. 74–99. ^ Waugh 1973, p. 55. ^ Rohr 1965, p. 72. ^ Mayall & Mayall 1938, pp. 58, 107–112. ^ Waugh 1973, pp. 70–73. ^ Mayall & Mayall 1938, pp. 58–112, 101–117, 1458–146. ^ 44.0 44.1 Rohr 1965, p. 79. ^ Mayall & Mayall 1938, p. 138. ^ Rohr (1965), pp. 70–81; Waugh (1973), pp. 100–107; Mayall and Mayall (1994), pp. 59–60, 117–122, 144–145. ^ Rohr (1965), p. 77; Waugh (1973), pp. 101–103; Capt. Samuel Sturmy. The Art of Dialling. London: Unknown publisher. 1683. ^ Rohr 1965, pp. 114, 1214–125. ^ Mayall & Mayall 1938, pp. 60, 126–129, 151–115. ^ Waugh 1973, pp. 174–180. ^ Rohr 1965, p. 17. ^ Rohr 1965, pp. 118–119. ^ Mayall & Mayall 1938, pp. 215–216. ^ Mayall Mayall, p. 94. ^ Waugh 1973, p. 157. ^ Turner 1980, p. 25. ^ Mayall & Mayall 1938, pp. 190–192. ^ Mayall & Mayall 1965, p. 169. ^ Rohr (1965), p. 15; Waugh (1973), pp. 1–3. ^ 63.0 63.1 63.2 63.3 63.4 National Maritime Museum; Lippincott, Kristen; Eco, Umberto; Gombrich, E. H. The Story of Time. London: Merrell Holberton in association with National Maritime Museum. 1999: 42–43. ISBN 1-85894-072-9. ^ 64.0 64.1 64.2 St. Edmundsbury, Borough Council. Telling the story of time measurement: The Beginnings. [2008-06-20]. （原始内容存档于August 27, 2006）. ^ Rohr (1965), pp. 109–111; Waugh (1973), pp. 150–154; Mayall and Mayall, pp. 162–166. ^ Waugh (1973), pp. 166–167. ^ Rohr (1965), p. 111; Waugh (1973), pp. 158–160; Mayall and Mayall (1994), pp. 159–162. ^ Rohr (1965), p. 110; Waugh (1973), pp. 161–165; Mayall and Mayall (1994), p. 166–185. Sundials: Their Theory and Construction, Albert E. Waugh, Dover Publications, Inc., 1973, ISBN 978-0-486-22947-8. "Sundials Old and New", A.P.Herbert, Methuen & Co. Ltd, 1967.